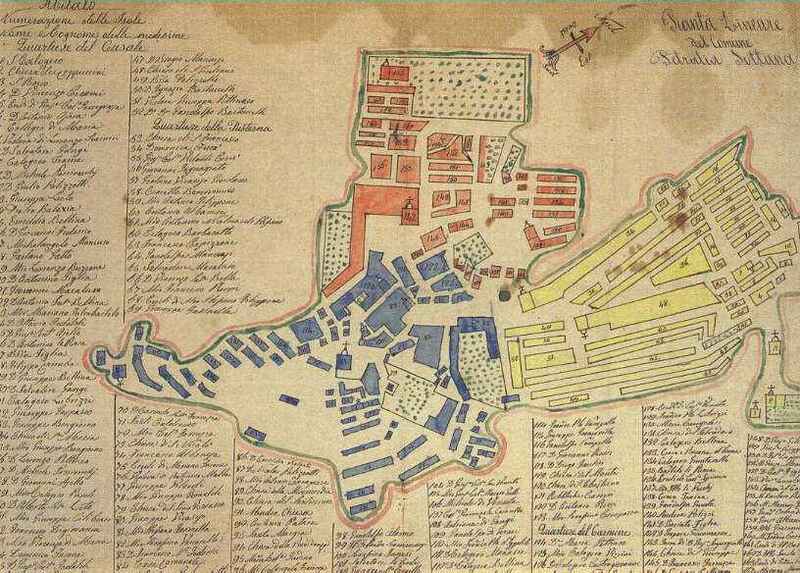 There is a wonderful, 19th century hand-drawn map of Petralia Sottana, with a handwritten, numbered list of buildings and householders' names. There is an image of this map on the internet, courtesy of the Petralia Sottana Library. The map is part of someone's private collection. The town is divided into three districts: The Quartiere del Casale (in yellow), the Quartiere della Pusterna (in blue) and the Quartiere del Carmine (in red). There are 165 buildings on this list, some of them churches. The last row of names is partially cut off in my copy. The buildings are numbered in a fairly sequential order. on the map. I am not an Italian writing expert, and many of the names are difficult to read, so do not assume that the names here are absolutely correct. However, I am familiar with a number of the surnames here, and there are definitely spelling variations from current spellings. Based on the fact that my great great grandfather's name is listed on the map (born circa 1840) but my great grandfather's is not (born 1862), I estimate this map to have been drawn somewhere between 1860-1880, before my great grandfather struck out on his own. The value of this map is that you may be able to determine who was in an earlier generation of your surname. Please use these lists as a guidepost, not as concrete information - make sure you use other sources to validate the names here. If you have a name correction or suggestion on a more logical name or spelling, please let me know. I intend to index the names listed here in the near future. Sorry they are not indexed at present. Churches and public buildings are italicized. Spelling Rules for abbreviations of names and letter changes. More information on reading Sicilian writing.